It’s very rare to get to see a comet which is so bright that you can easily see it from the middle of a housing estate through light haze with a near full Moon with just your eyes. No telescope, no binoculars, nothing! But that’s what I’ve just done. The Periodic comet 17/P Holmes has just surprised the heck out of Astronomers by brighting from Magnitude 17 (you need a professional grade telescope to see things that faint) to Magnitude 3 (easily visible with the naked eye) literally over-night. Obviously something very spectacular just happened on the comet. 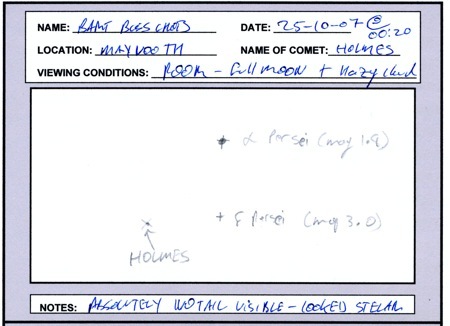 Thanks to an email with coordinates form Terry Mosley I knew Holmes could be found near delta Persei at around midnight. When I got outside conditions were very poor and not helped by the street lights all around me. As I mentioned there was a near full Moon high to the south and a think layer of haze across the whole sky being lit up by the Moon. Needless to say my expectations weren’t high. However, Holmes was so bright that it distorted the shape of Perseus to the extent that I had trouble finding the constellation! My brain just kept saying “no, that’s not Perseus, Perseus doesn’t have that nice little triangle of stars in it”. You guessed it, one of those three stars was not a star at all but the comet. To me Holmes looked to be about the same brightness as Delta Persei so that would put it at around the Magnitude 3. I’ve never seen a comet like this before. It looks just like a star, even in binoculars. No Coma, no tail, nothing, just a point of light. For all the world it looks like an extra star has appeared out of nowhere in Perseus. I’ve attached a scan of my record of the observation below. I read about the comet in Prophecy News Watch-a news letter about Bible Prophecy in the news (www.prophecynewswatch.com). Other Scripture speaking of the night sky says, “And God said, Let there be lights in the firmament of the heaven to divide the day from the night; and let them be for signs, and for seasons, and for days, and years” (Genesis 1:14). A sign is something that proclaims a message. Interestingly, the late Dr. James Kennedy, has written a book entitled, The Real Meaning Of The Zodiac, in which he described the meaning of all twelve of the constellations of the Zodiac with their decans. In his explanation on pages eighty-six through page eighty-nine, he describes the constellation, Perseus, The Breaker, as another picture of Jesus Christ, who cuts off the head of Medusa (Satan) and sets the chained Andromeda (picture of the Church) free, taking her home with Him to His heavenly throne, where He makes her His bride. This really adds to the excitement for me! It’s great that you are really enjoying this comet but I honestly can’t say that I see the comet as having anything to do with religion except perhaps as a source or wonder and awe at the universe. The constellations we know came into existence long before the birth of Christ and giving them Christian meanings is just revisionism as far as I’m concerned. I also don’t hold with the idea that our future is written in the stars. I like the idea that we make our own futures and that we have free will to do what ever we want. It’s also very strange to hear a Christian talking about Astrology like that. I was under the impression most churches were against that kind of thing, the Vatican certainly is. Anyhow, thanks for sharing your experiences and make the most of this great event and get out and observe it as much as you can! Given the fact that the Magi found the Christ child because of an astrological (star)I don’t think its that surprising to hear religious persons, inculding Christians, recognizing the significance of astrology. I am both a devoted Christian and a believer in astrolgy, as are many others. As to the physical date of stars and the physical incarnation of Christ as Jesus, from a logical point of view, there does not need to be a linear progression of this one versus that one “first” for the two to be theoretically linked. I have no idea what Comet Holmes is all about, but I too find it compelling.